Short Product Description: Activated Charcoal Soap Bar with Beeswax, Honey and Lanolin. 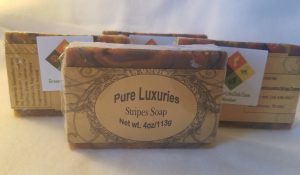 Large over-cut soap bars. Honeycomb accent on the ends. Scented with only pure essential oils. Top notes are Cedarwood and Bergamont. 1.Takes Care of Oily Skin. All natural soap with activated charcoal, beeswax, honey, and some great skin lovin’ oils like Sunflower, hemp and Olive Oils. Scented with Cedarwood and Bergamont.